This is a real personal post, maybe something I have never shared in this way before but I want to advocate more for mental health so here we go.. I have two black dogs. Sometimes I only have one. But once I see him, I know the other one will shortly follow. I don’t always have the black dogs with me. Some days I feel completely weightless, like I’m not carrying a burden. I’m so used to the black dogs being around. I feel guilty not having them. I worry if they are not with me they are with someone else. But when they are there I want them to leave. I wish they would die and never return. But they can not be killed. 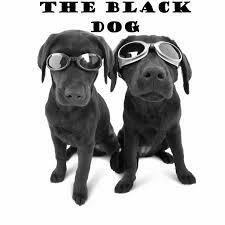 The black dogs names are depression and anxiety. You never know when they are going to come back to their master. Although I am their master I have no control over them. They are constantly barking. Confusing me. I can’t think with them barking so loudly. The shame of owning these black dogs is real. You feel like they are a sign of weakness. You don’t want anyone knowing you have these black dogs. Especially dogs you can’t control. When you see friends, you put the music on loud, so they can’t hear the black dogs. You pull the curtain so they can’t see the black dogs. You’re so busy worrying about people seeing the black dogs, so worried the black dogs will escape and bite someone that you give up trying. You isolate yourself, wanting to be alone with them. You start to push away all that is happy and joy. You just want to lay in a room alone, with maybe Netflix and your fan because with the fan going, you feel like you can keep breathing. You make up excuses to not hang out with friends because you are scared these dogs will attack while you are out of your comfort zone. You go home from work and even though you use to have things that brought you joy, you just want it all gone out of your house now as it is more stressful having it there because it feels like a joy robber. you see other people with items and you feel oh that will bring back my joy, then you get said item and no joy follows, this goes on until you are in a never ending downward spiral. Getting up from this spiral is one of the hardest things you have done, you cannot get a good hold on life, you keep slipping, sure there are good days, and bad days. You just want to feel normal, but remember normal is a setting on the dryer. This is a great and very vulnerable post. I too feel this way often and it’s so hard to describe what I’m going through to friends. Thanks for sharing! With sharing this post you are starting the process of putting the leash on these black dogs! Yes, they may break off it at times, but with naming them and acknowledging their presence you are going in the right directions. You are not alone! You did such a good job describing depression and anxiety and what they are like to live with. I am sure many will benefit from your vulnerability.